Toshiba has introduced an external hard drive solution called the Canvio AeroCast Wireless Hard Drive ($219.99) that is designed to work with the Google Chromecast, providing an easy way to back up all of your music, photo, and video files and then play them through your AV system using the Chromecast bridge. Toshiba also introduced the Canvio Cast Wireless Adapter ($79.99) that adds wireless media streaming to an existing hard drive. Toshiba's Digital Products Division (DPD), a division of Toshiba America Information Systems, Inc., today introduced the Canvio AeroCast Wireless Hard Drive, an innovative device that blends the benefits of high-capacity external storage with the ultimate in wireless freedom. Users can connect to their Chromecast device (sold separately) to experience their personal digital content such as movies, music and photos--by downloading Toshiba's Google Cast Ready app to cast entertainment from the Canvio AeroCast Wireless Hard Drive to an HDTV. The 1TB Canvio AeroCast Wireless Hard Drive is a fast and reliable all-in-one device that helps manage storage needs wirelessly. Users can easily upload and back up content from their mobile devices directly to the Canvio AeroCast Wireless Hard Drive for secure, centralized storage. Instant access is available to stored files through the device's own local Wi-Fi connection (no Internet required). The Canvio AeroCast Wireless Hard Drive has a battery life of up to five hours and can connect simultaneously with up to six devices, making accessing and sharing files from the digital library easier than ever. Also announced today, the Canvio Cast Wireless Adapter extends the usefulness of existing hard drives, letting users wirelessly upload, share, download and stream their stored digital library from the hard drive to any connected mobile device. The Canvio Cast Wireless Adapter is compatible with iPad, iPhone, and Android mobile devices. The release of the Canvio AeroCast Wireless Hard Drive and Canvio Cast Wireless Adapter expands Toshiba's portfolio of wireless products, which is aimed at satisfying a broad range of customer needs. 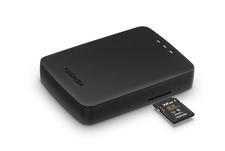 Previously announced were the Canvio Wireless Adapter and Canvio AeroMobile Wireless SSD, which are both now on sale. The 1TB Canvio AeroCast is now available for purchase at select retailers and on toshiba.com/us/ for $219.99 MSRP. The Canvio Cast Wireless Adapter is also available for purchase at select retailers and on toshiba.com/us/ for $79.99 MSRP. • Google Chromecast Wireless Media Bridge Reviewed at HomeTheaterReview.com. • Toshiba Debuts Two New Ultra HD TVs at HomeTheaterReview.com.